Gdansk welcomed us with delicate fog and faltering rain. The city emerged from beneath us suddenly appearing out of the sea of tangled clouds. We arrived 40 minutes earlier, so we still had some time for coffee and to put ourselves in the mood for the weekend attractions. I was already familiar with the Lech Walesa airport – I’d said goodbye to the band there one year before, after their show in Poznan. 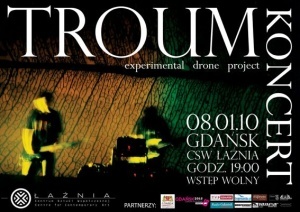 It was then a year and two months after the last Troum’s concert in Poland and 12 years since their first time here, in Gdansk also. In 1999 in St. John’s Church, as one of the band member’s said, there took place one of their most mystical performances ever (while their career continued for 25 years already). Glit[S]ch describes it as follows: "it was winter, peaceful and quiet, as if there were no tourists except us; like a sleeping town stemming from a fairytale. The Church was under restoration, empty and devoid of the paintings of the saints, decorations. The only element that was left of the church arrangement was the altar in the middle. That was a very affecting thing to see - we could feel that strike of industrial with religiousness and, at the same time, in some astonishing way those two worlds united, their aesthetics harmonised, creating something multidimensional. The experience was very ritual and intensive". This time Troum took a chance to play in a more official and artistically tasteful venue which was Centrum Sztuki Wspolczesnej Laznia (Contemporary Art Centre). The concert was a part of a cycle In Progress where the well-known projects of the ambient/industrial scene were performing, among them were Michal Jacaszek, Job Karma, Zbigniew Karkowski. Thus, with such fellowship, the Bremen’s Troum was a lacking cherry on the cake. Surprisingly, the entrance was free, so happily for the organizers consideration, it illustrates that it is possible to finance independent music in Poland. Moreover, the turnout (over 120 people attending) proves that the interest in non-commercial music is strong, and with the officials support, exploring underground music becomes more approachable. The concert started on time, the band was awaited long before. As they were the first and last star of the night, they added a few more minutes to their repertory. Troum never plays tracks from the albums, each live show is deliberately prepared and makes a variation about the forthcoming/past recordings, depending mostly on personal mood of the members, their inner vibrations of which they compose the sort of oncoming ritual of spiritual catharsis. While playing live, the project cares a lot about naturalness of the concert, using mostly live instruments with a little support with the use of samples, yet they never cross the border outside the laptop. I was especially captivated with the last part of the show, in which they included the leitmotivs from "TROUM - "BACH EINGESCHALTET - DRITTER BAND", the newcomer album from series of electronic interpretations on Bach released by TuT/RuR label.